Nice outfit! Love the yellow blouse. Awww, u look so cute, I love your nails and hair too!! héééé, u have braided your hair finally (I'm missing your natural hair)...anyway U look Stunning!!! Especially your necklace which looks like a collar!! 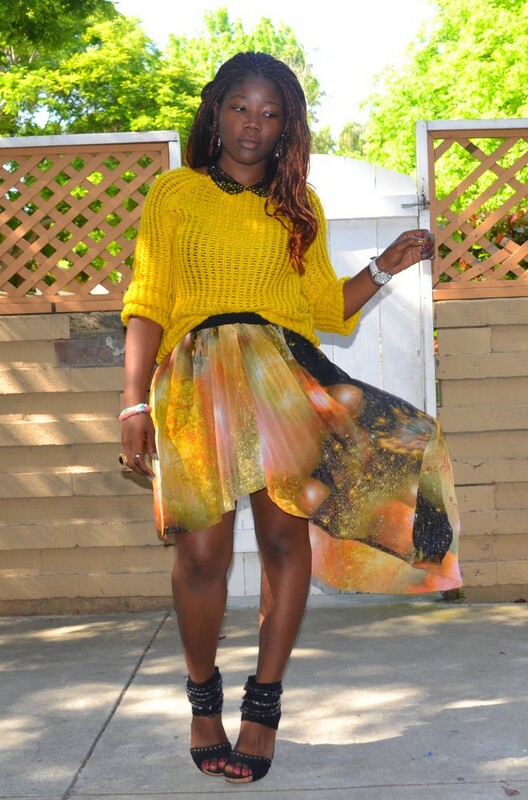 ahhh i want that skirt! loving the braids and that skit is wowww! oooooh. I love the sweater. I wouldn't be brave enough to wear that skirt, but you pull it off really nicely. Lovely outfit!!!! Awesome skirt! That skirt is like fireworks.....like a magical night sky. Amazing, really. You seriously look amazing in these pictures! And that skirt is sooo cool!!!! J'adore ! Et elle va parfaitement avec ce haut. Et tes tresses sont canons, ça te va super bien ! J'ai longtemps hésité à m'acheter cette jupe..finalement j'aurais du la prendre! super ce look, j'aimerai bien en avoir une comme ça!! j'aime bcp et ta nouvelle coiffure te va bien! Your outfit is beautiful, dear! I loved ur mullet skirt!! have to go get myself something in galaxy print stat! Love this look! The shade of yellow in your top is gorgeous. oh so pretty diane!! 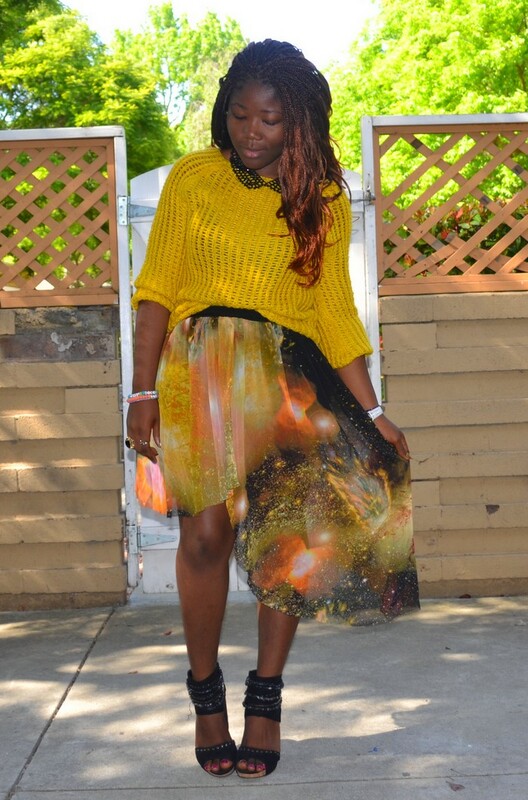 i love how you styled this galaxy skirt!!! :) thank you too! waow trop belle ta jupe Dee!!! j'adore elle te va trop bien!! tes ongles et tes accessoires sont tops!!! Gorgeous colors especially the honey mustard! :) Thanks for visiting my blog! You are an amazing galaxy girl!! 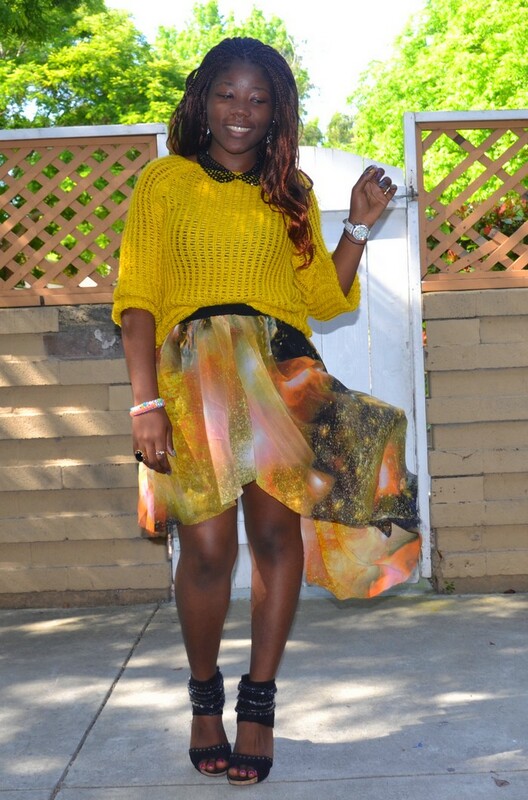 Perfect match between the skirt and the sweater!! sooo loving this look! the galaxy skirt is really unique!! 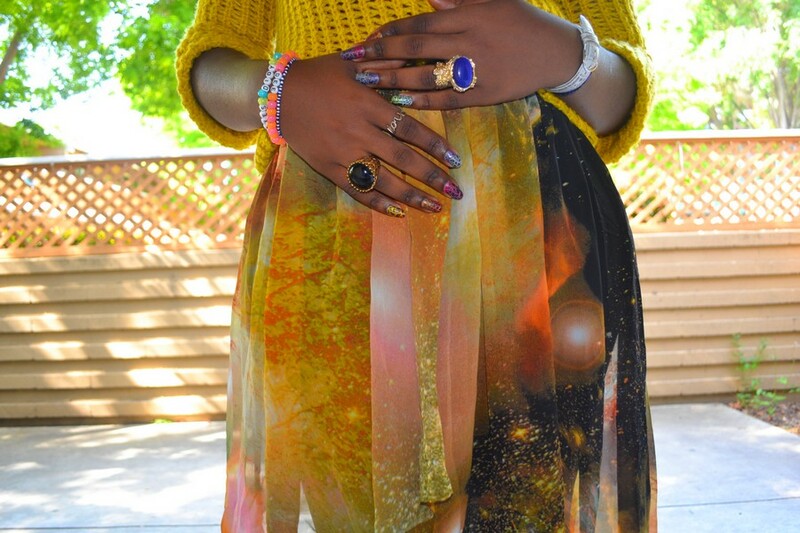 wow, galaxy skirt... i wanted to have a galaxy skirt also! Great blog babe. U have an amazing sense of style. And most of all.... I fell in love with your nails!!! 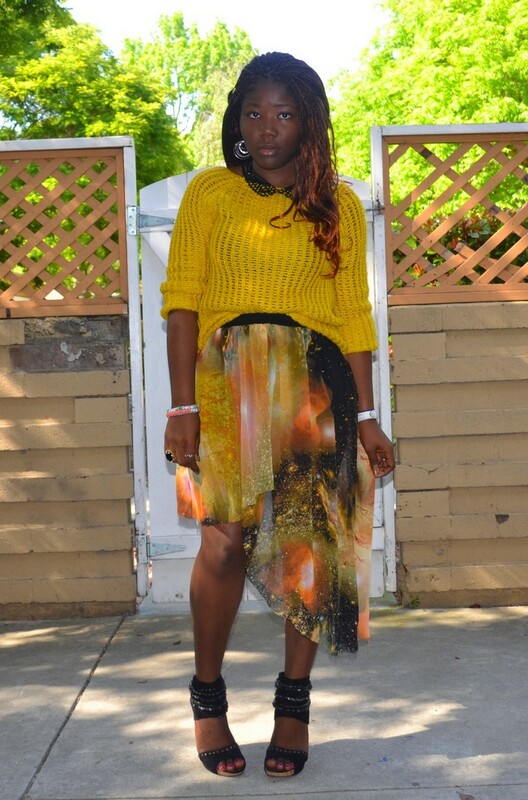 Love how you styled this skirt with that sweater. PERFECTION. 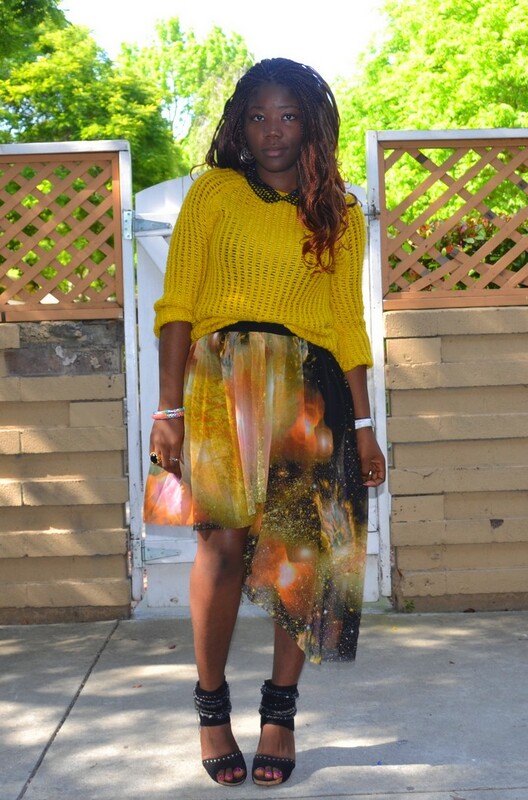 loving the galaxy skirt, great combo. Adore this outfit! That skirt is fabulous! j'aime beaucoup! your skirt is amazing! that skirt is GORGEOUS!! lovelove./. Oh my goshhh.. I've been looking for a skirt just like this Everrryyywhere! !